We lost one of the great Jewish comedians last week with the passing of Don Rickles at age 90. Although he became well known as an insult comic, his pudgy, balding appearance and pugnacious style led to few leading roles in film or television. His prominent film roles included Run Silent, Run Deep (1958) and Kelly's Heroes (1970), and beginning in 1976 he enjoyed a two-year run starring in the sitcom C.P.O. Sharkey. He received widespread exposure as a popular guest on numerous talk shows, including The Tonight Show Starring Johnny Carson and Late Show with David Letterman, and later voiced Mr. Potato Head in the Toy Story films. He won a Primetime Emmy Award for the 2007 documentary Mr. Warmth: The Don Rickles Project. Today we're remembering Don Rickles as a "roaster" of celebrities on The Dean Martin Celebrity Roast, an NBC television special show hosted by entertainer Dean Martin from 1974 to 1984. 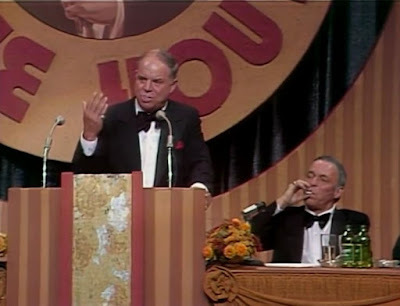 For a series of 54 specials and shows, Martin would periodically "roast" a celebrity. These roasts were patterned after the roasts held at the New York Friars' Club. The format would have the celebrity guest seated on a dais, and one by one the guest of honor was affectionately chided or insulted about his career by his fellow celebrity friends. In 1978, 39 years ago, Rickles turned in a hilarious performance on the Dean Martin Celebrity Hour roasting Frank Sinatra. The guests included Ronald Reagan, Red Buttons, Flip Wilson, Redd Foxx, George Burns, Milton Berle, Jonathan Winters, Peter Falk, Ruth Buzzi, and Orson Welles. They are all gone now. How fleeting is fame, and how forced that humor seems today. But thank you for showing the clip. A Joke to Start the Week - "Red Sea Rescue"